In Chinese mythology, Nüwa (Traditional Chinese: 女媧; Simplified Chinese: 女娲; Pinyin: nǚwā) is a Chinese mythological character best known for creating and reproducing people after a great calamity. Some scholars suggest that the female Nuwa was the first creative Chinese deity, appropriate for ancient Chinese matriarchal society, in which childbirth was seen to be a miraculous occurrence, not requiring the participation of the male. The earliest myths represent Nuwa as a female in a procreative role; in later stories Nuwa has a husband/brother named Fuxi, who assumes primary importance. In ancient art, Nuwa is often depicted with a snake body and a human head. According to myth, Nuwa shaped the first human beings out of yellow clay, then grew tired, dipped a rope into the mud and swung it around. The blobs of mud that fell from the rope became common people, while the handcrafted ones became the nobility. Another myth recounts how Nuwa saved mankind from terrible flooding and destruction. In Chinese mythology, Nüwa was a mythological character, generally represented as a female. (Other later traditions attribute this creation myth to either Pangu or Yu Huang.) Nüwa appears in many Chinese myths, performing various roles as a wife, sister, man, tribal leader (or even emperor), creator, or maintainer. Most myths present Nüwa as female in a procreative role, creating and reproducing people after a great calamity. Nuwa is also associated with a deluge myth, in which the water god Gong Gong smashed his head against Mount Buzhou (不周山), a pillar holding up the sky, collapsing it and causing great floods and suffering among the people. The earliest literary reference to Nuwa, in Liezi (列子) by Lie Yukou (列圄寇, 475 - 221 B.C.E. ), describes Nüwa repairing the heavens after a great flood, and states that Nüwa molded the first people out of clay. The name “Nuwa” first appears in "Elegies of Chu" (楚辞, or Chuci), chapter 3: "Asking Heaven" by Qu Yuan (屈原, 340 - 278 B.C.E. ), in another account of Nuwa molding figures from the yellow earth, and giving them life and the ability to bear children. Demons then fought and broke the pillars of the Heavens, and Nüwa worked unceasingly to repair the damage, melting down the five-colored stones to mend the Heavens. Some scholars suggest that the female Nuwa was the first creative Chinese deity. Ancient Chinese society was matriarchal and primitive. Childbirth was seen to be a miraculous occurrence, not requiring the participation of the male, and children only knew their mothers. As the reproductive process became better understood, ancient Chinese society moved towards a patriarchal system and the male ancestral deity, Fu Xi, assumed primary importance. By the Han Dynasty (206 – 220 C.E. ), Nuwa was described in literature with her husband Fuxi as the first of the Three August Ones and Five Emperors, and they were often called the "parents of humankind." In the earliest Chinese dictionary, Shuowen Jiezi (說文解字), by Xu Shen (58 - 147 C.E. ), Nüwa is said to have been both the sister and the wife of Fuxi. However, paintings depicting them joined as half people, half snake or dragon, date as far back as the Warring States period (fifth century B.C.E. to 220 B.C.E.). A stone tablet from the Han dynasty, dated 160 C.E., depicts Fu Hsi with Nüwa, who was both his wife and his sister. Some of the minorities in South-Western China hail Nüwa as their goddess and some festivals, such as the 'Water-Splashing Festival,' are in part a tribute to her sacrifices. Nüwa is also the traditional divine goddess of the Miao people. An ancient painting of Nüwa and Fuxi unearthed in Xinjiang. 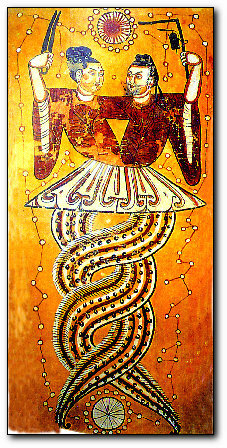 Nuwa is not considered a creator of the entire physical universe, but a creator and protector of animals and people. It is said that Nüwa existed in the beginning of the world. The earth was a beautiful place with blossoming trees and flowers, and full of animals, birds, fish and all living creatures. But as she wandered about it Nüwa felt very lonely, so she began to create animals. On the first day she created chickens. On the second day she created dogs. On the third day she created sheep. On the fourth day she created pigs. On the fifth day she created cows. On the sixth day she created horses. On the seventh day, she bent down and took up a handful of yellow clay, mixed it with water and molded a figure in her likeness. As she worked, the figure came alive - the first human being. Nüwa was pleased with her creation and went on making more figures of both men and women. They danced around her, and her loneliness was dispelled. She created hundreds of figures, but grew tired of the laborious process. Then she dipped a rope in the clay mud, and swung it around her. Soon the earth around her was covered with lumps of mud. The handmade figurines became the wealthy and the noble; those that arose from the splashes of mud were the poor and the common. A variation on this story relates that some of the figures melted in the rain as Nüwa was waiting for them to dry, and that in this way sickness and physical abnormalities came into existence. 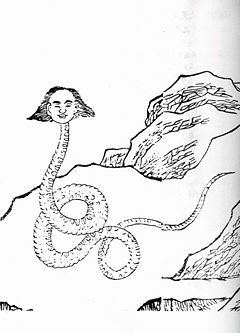 Similarly, aspects of the Nuwa creation myths, such as the creation of humans from mud, the Fuxi-Nuwa brother-sister pair, the half-snake element, and survival of a flood, resemble creation myths from other cultures. Nuwa and Fuxi resemble the Japanese brother-and-sister deities Amaterasu and Susanoo. Below are some of the sources that describe Nüwa, in chronological order. These sources do not include local tribal stories or modern recreations. 1) (475 - 221 B.C.E.) author: Lie Yukou (列圄寇), book: Liezi (列子), chapter 5: "Questions of Tang" (卷第五 湯問篇), paragraph 1: account: "Nüwa repairs the heavens" Detail: Describes Nüwa repairing the heavens after a great flood. It also states that Nüwa molded the first people out of clay. 2) (340 - 278 B.C.E.) author: Qu Yuan (屈原), book: "Elegies of Chu" (楚辞, or Chuci), chapter 3: "Asking Heaven" (天問, or Wentian), account: "Nüwa Mends The Firmament" Detail: The name Nüwa first appears here. This story states that Nüwa molded figures from the yellow earth, giving them life and the ability to bear children. Demons then fought and broke the pillars of the Heavens. Nüwa worked unceasingly to repair the damage, melting down the five-colored stones to mend the Heavens. 3) (179 - 122 B.C.E.) author: Liu An (劉安), book: Huainanzi (淮南子), chapter 6: Lanmingxun (覽冥訓), account: "Nüwa Mended the Sky" Detail: In remote antiquity, the four poles of the Universe collapsed, and the world descended into chaos: the firmament was no longer able to cover everything, and the earth was no longer able to support itself; fire burned wild, and waters flooded the land. Fierce beasts ate common people, and ferocious birds attacked the old and the weak. Nüwa tempered the five-colored stone to mend the Heavens, cut off the feet of the great turtle to support the four poles, killed the black dragon to help the earth, and gathered the ash of reed to stop the flood. Variation: The four corners of the sky collapsed and the world with its nine regions split open. 4) (145 - 90 B.C.E.) author: Sima Qian (司馬遷), book: Shiji (史記), section 1: BenJi (本紀), chapter 1: prolog Detail: Nüwa is described as a man with the last name of Feng, who is related to Fuxi; and possibly related to Fenghuang (鳳凰, pinyin: fènghuáng). 5) (58 - 147 C.E.) author: Xu Shen (許慎), book: Shuowen Jiezi (說文解字), entry: Nüwa Detail: The Shuowen is China's earliest dictionary. In it, Nüwa is said to have been both the sister and the wife of Fuxi. Nüwa and Fuxi were pictured as having snake-like tails interlocked in an Eastern Han dynasty (25 - 220) mural in the Wuliang Temple in Jiaxiang county, Shandong province. 7) (618 - 907 C.E.) author: Lu Tong (盧同), book: Yuchuan Ziji (玉川子集), chapter 3 Detail: characters: "與馬異結交詩" 也稱 "女媧本是伏羲婦," pinyin: "Yu Mayi Jie Jiao Shi" YeCheng "Nüwa ben shi Fuxi fu," English: "NuWa originally is Fuxi’s wife"
8) (618 - 907 C.E.) author: Sima Zhen (司馬貞), book: "Four Branches of Literature Complete Library" (四庫全書, or Siku Quanshu) , chapter: "Supplemental to the Historic Record – History of the Three August Ones" Detail: The three August Ones ([[Three August Ones and Five Emperors|San Huang]]) are: Fuxi, Nüwa, Shennong; Fuxi and Nüwa were brother and sister, and have the same last name "Fong" or Feng. Note: SimaZhens commentary is included with the later Siku Quanshu compiled by Ji Yun (紀昀) & Lu Xixiong (陸錫熊 ). ↑ Association for Promoting the Protection and Use of the Imperial Temples of Emperors of Successive Dynasties in Beijing, along with the Administrative Office of the Imperial Temples of Emperors of Successive Dynasties in Beijing. 2007. Worshiping the Three Sage Kings and Five Virtuous Emperors - The Imperial Temple of Emperors of Successive Dynasties in Beijing. (Beijing: Foreign Language Press. ISBN 9787119046358). This page was last modified on 15 December 2018, at 16:37.